The Hauck Freerider is a 3 wheeler tandem stroller with the second seat at the back and lower than the main seat, similar to the likes of Phil & Teds. It comes with the second seat, instead of it being an option. You can opt for the Shop 'n Drive model which is essentially a package of same stroller bundled with an infant car seat. As with any Hauck user manual, it comes with pictures only. However, fixing up the stroller is not an uphill task. You are only required to fix the 3 wheels and sun shade. The 2nd seat can just be easily slipped on and off with a catch. The front seat reclines by pulling a metal lever at the back of the seat and it can recline till it's fully flat. To lift it up, you simply push the seat up until it locks to any of the 4 positions available. This is a pretty good mechanism if your ask me as you can operate it with one hand. When fully up, the main seat is almost 90° so it is good for kids who likes to sit up straight. However, when straight up, the space between the backrest and the bar strap is pretty small, so if you have a big baby, it might be uncomfortable for your kid. The main seat can accommodate an infant car seat without having to remove it although you will have to raise the incline by one step from flat to allow enough space for the child in the rear seat. The main seat can also be removed totally if you plan to use the infant car seat exclusively, as shown below, though it is not advisable to sit a infant in the car seat for more than an hour at any one time. The rear seat can on the other hand can only recline further by one step by means of a zip. This limitation is expected. The calf support and handle is adjustable to a few heights. The thickly padded seats are very comfortable and of good quality. The handle construction disappoints me as it has too much play, making it feels like the stroller is a few years old. This however do not affect the function of the stroller that much except when you place a bigger child in the main seat and the back seat unoccupied. Due to the weight being concentrated at the front, it can be a a challenge when you need to lift the stroller up a kerb. The wheels are made of plastic. Although most will say that inflatable wheels are much better, not having to pump air can be a plus at times, especially if you keep the stroller in your car most of the time. The calf support is pretty much hollow with nothing much in between. 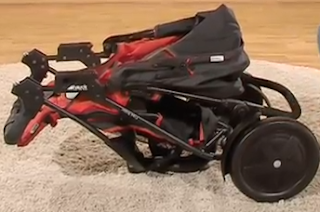 The stroller folds up not too bad but the front wheel is not able to be aligned flat and it is the main part that is causing problems when loading up to the boot trunk of the car. 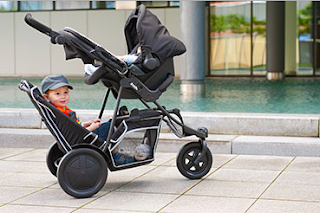 As the sun shade attaches by simply slotting it into a groove on the chassis but without any form of locking mechanism, it always detaches itself each time the stroller is folded. A similar poor design applies to the main seat backrest mounting. 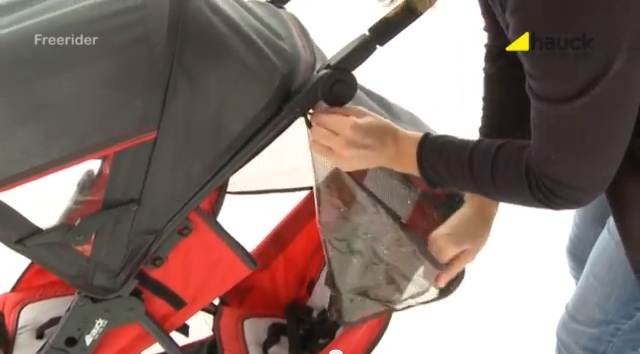 As it do not have a locking mechanism, it always detaches itself on either/both sides each time you fold your stroller. Again, another poor design is the rear seat rod end cover. It always slips off when you remove the seat. You have to slot it back in place each time you want to attach the rear seat. A velcro should solve this problem so I don't understand why it was not thought off by Hauck designers. Overall the stroller is alright except for a few annoying setback. For the price you pay, it is forgivable though if you can fork out more, do it. Sun shade is flimsy. Easily detached itself especially when you fold the stroller. Extendable shade has no place to store into. Either you cover the rear seat or you remove it. Rear seat rod end cover always slips off when you remove the seat. You have to slot it back in place each time you want to attach the rear seat.